Made by Zagato, Amelio in Paris, France, 1984. Single womens slip on shoe of cemented construction with square toe and stacked heel constructed to mimic a car. The shoe consists of a navy leather upper which has been cut and white and black leather inserts stitched under the navy to simulate wheels, headlights and the grille of a car. The tab also been cut for the insertion of a clear plastic 'windscreen'. The shoe is top edge bound in red. The lining is in cream leather with a suede heel grip and the sock is also in leather. The leather heel features a rubber top piece and the leather sole is highly polished. Spring/Summer collection 1984. Trademark stitched on synthetic fabric stitched to sock, "TOKIO KUMAGAI/PARIS" perpendicular to main name "MADE IN ITALY", white paper label on sole, printed in black, "ART. 383" (4 written over number in pencil) GB/ CAPRETTO BLEU 427/ MONOBLOCCO", leather mark on waist of sole, stamped hide shape with text within, "VERO CUOIO" beneath, "MADE IN ITALY/ 36"
Tokio Kumagai was known for his unusual shoe making designs and his ability to successfully utilize shoes beyond their functional purpose. Combining traditional construction shapes and witty detail, his designs were very fashionable in the the 1980s. After Tokio Kumagai (born Japan, 1948 - died France, 1987) completed his studies in Tokyo in 1970 he headed for Paris where he worked with Castlebajac and later with Cerruti in Italy. In 1981 he opened his first shoe boutique in Paris at the exclusive address of Place des Victoire. Kumagai is famous for representing in his shoe designs the work of artists such as Dali, Kandinsky and Mondrian as well as playfully mimicking subjects such as sportscars, mice or African art. It is this innovative approach to design, incorporating handpainting as well as a wide range of materials, which has ensured Kumagai's shoes as collector's items. 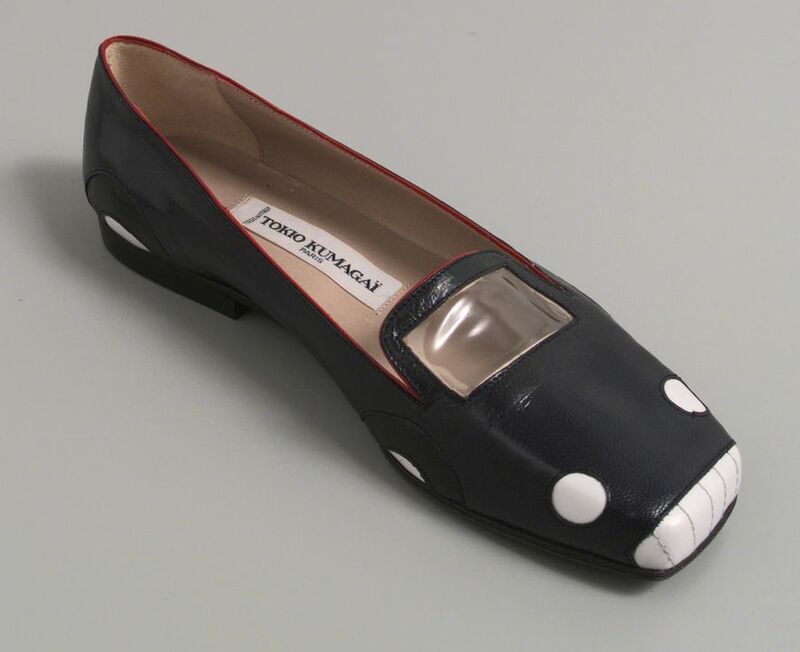 After Kumagai died, his Italian agent and friend, Amelio Zagato of Heresco, continued his role to produce shoes based on Kumagai's original designs from the 1980s. The shoe have been acquired direct from Amelio Zagato of Heresco in Milan.